I am trying very hard not to slip back into my tendency not to blog, but hopefully after my last post you all have an idea of what I've been up to. The project consuming most of my non-mom-time has been trying to get ready for the March bead show. It's not the nearest deadline, but it's the biggest. So, I've been plugging away at making beads. I'm also trying to take advantage of a half-price sale to get a banner printed, since I don't have one yet. 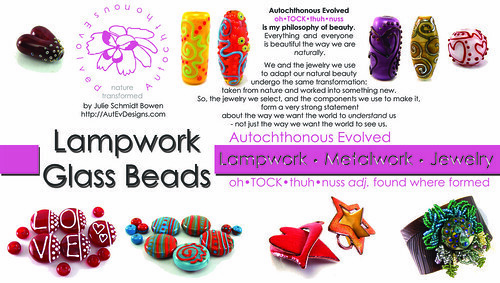 So, I've been working on getting good photographs of my best representative work and creating a banner design. 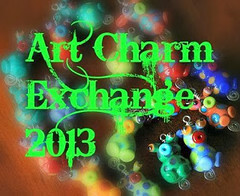 The banner design has been tricky because I don't want my banner to be the same as everyone else's (who does? ), but obviously it still needs to be clean, effective design. My tendency is more to go crazy creative. The result makes sense to me ... not so much to everyone else. In case you have banner-creation in your future, one web page that I found inspiring was 20 banner samples from Creative Overflow. I liked it because it had visual examples rather than the basic, pure text admonishments: keep it simple, less is more, keep it organized and structured, balance text with images, make sure the text is visible and readable. Important, core advice, to be sure. The visual examples are so much more helpful! I still have a couple of days to get my art in, so I'm going to put myself out here and ask for some constructive criticism. My thoughts were to have a central focal point that clearly told the people why they should come over. The photos are meant to support that. Then, if interested, they can read the rest ... like what about my unpronouncable business name makes it worth keeping. What do you all think of this? What would you do to make it better and why? If you click on the image, which will take you to my Flickr Photostream, you'll be able to see the full readable 100dpi image. Also on my list of things to-do, I forgot to list that I also have my son's preschool fundraiser coming up, and I've also been working on donations for that. 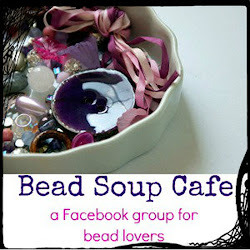 One of which is creating a set of initial focal beads for personalized pendants. I've been about half-way done for three weeks. Yup. 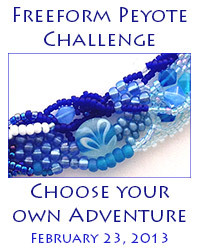 The Freeform Peyote Challenge reveal is also this weekend. And my brother-in-law and sister-in-law are coming for the weekend. And I still need to clean. If I can manage to keep my maniacal laughter of insanity on the inside, that'll be a start. I like where you're going, because your beads are so eye-catching and beautiful. The banner as a whole strikes me as a little too busy with all the text, though, and it detracts from the beads which should be the star. What if you took all of the explanation of your name off of the banner, and made it a sign on your table, or included it on your business card? That way, when they get to your table, they're busy looking at the beads for sale, rather than reading your banner! That's good advice, Bobbie! I am torn by the text. The idea of having a sign on the table is a really good one. I had been thinking that, if people were interested enough, they'd come closer to read the poster, but I suppose if they're that close they could grab a card on the table, too.